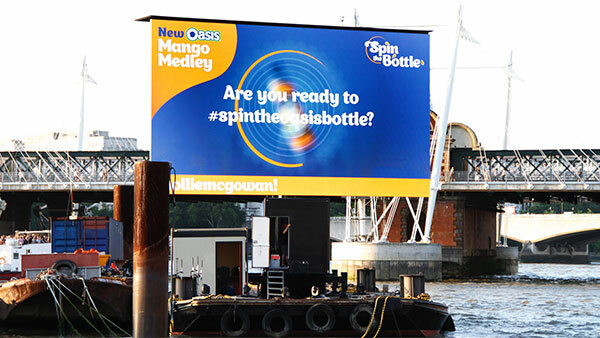 We worked on an event for Oasis' new Mango Medley flavour drink. The brief was to drive sales amongst 16-24s, by generating a buzz around the product launch. We created the world\'s biggest game of spin the bottle on the London Eye. The entry mechanic was an online version of the game hosted on Facebook. People could invite friends to play a game of spin the bottle and finalists were invited on the London Eye to play. Once the spinning bottle landed on a capsule, the winners won a VIP night in Mahiki. The campaign was a huge success and hailed as one of the most innovative experiential campaigns Oasis had carried out, and reached over 415 million people overall.